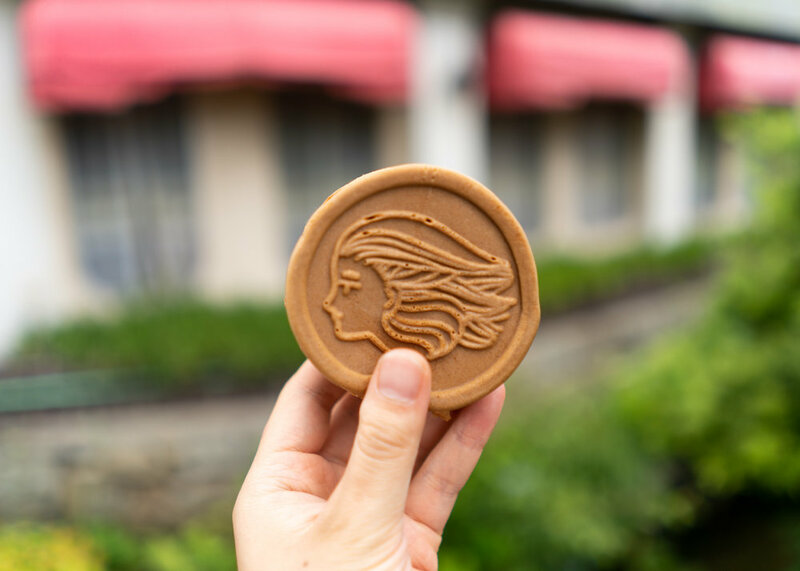 In the town of Fukuyama, there are some stores that sell delicious and mouthwatering sweets, like the ones that local people would tell me “The pudding of that store reminds me of the good days” or “Our family loves the taste of the soft-serve of that store ”. When I’m on a trip, visiting folksy places where locals go would make the trip more exciting. Here are some local stores you could find sweet desserts. Add them on your plans on a trip to Fukuyama! 1) Pudding-Top (pudding parfait) of cafe Luna (Motomachi). “cafe Luna” was opened on May 11, 1956. It is surprising to know that this coffee shop runs for more than 62 years despite the fact that most coffee shops are forced to wind up their shops in 30 years. It is an old-established store which still expands its business with numbers of branches. Back in 1956, when Cafe Luna started its business, initial salary of public workers was about 8,000 yen while Cafe Luna sold a cup of coffee for 50 yen, a cup of milk for 20 yen, a slice of toast for 30 yen, and a bowl of ice cream for 50 yen. Many salesmen visited the coffee shop from the morning for a brief meeting. After a meanwhile, a new menu, “Pudding-top” was developed by Ms. Murakami, a chair of Cafe Luna. The target customer was young people, so the concept of the new menu was “Cheap and Filling”. Then she came up of an idea of pudding parfait. She put jelly and filled a parfait glass with soft-serve. On top of the parfait, she put a pudding. The pudding is homemade and fruits on top vary with season. 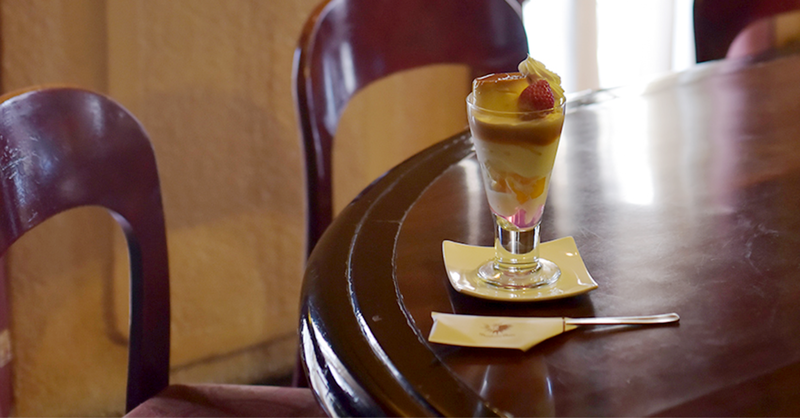 It is no wonder this pudding parfait became a big hit. Today, if you say ‘Pudding-top’ in Fukuyama, everyone would know that it’s the menu of Cafe Luna. “Tofu-ya Manten” was opened in Meiji-cho before WWII. At the back of the store, there stands a tofu factory. Local people gather in the morning to buy freshly made tofu. There are a variety of menus, such as ‘atsuage’ (thick deep-fried bean curd), tofu, ‘ganmodoki’ (deep-fried bean curd mixed with thinly sliced vegetables), tofu donuts and okara croquette. When I couldn’t decide which one to choose from these attractive menus, another customer ordered soymilk soft-serve. “Many people come to our store to buy soymilk soft-serve”, a staff told me. This soymilk soft-serve was certified as “Fukuyama’s Best 100” by residents in Fukuyama city. Fukuyutaka, a kind of soy, is used to produce the soymilk and it is blended with fresh cream with the best balance. This sweet and cool dessert was just the one I was craving for in a hot day. “Komaya” stands in Meiji-cho and its’ menus of ‘oobanyaki’ is a bit different from the ordinary ones. Oobanyaki is a Japanese round-shaped pancake containing sweet red beans or custard cream. Taking a look at the menus of Komaya, surely I could find oobanyaki with sweet red beans and custard cream. Aside from the ones that people regularly know, there were quaint menus such as ham egg, Vienna sausage and curry. “We put a great effort on pancakes!”, an owner of the store said. From early in the morning, he makes stuffings and pours them into doughs. After baking pancakes, he presses branding iron on the surface one by one by hands. A slightly sweetened pancake matches with any taste of stuffing. It’s a very filling one that I could have it for a light meal. At last, I would like to introduce a Japanese traditional sweets shop, “Fukuya” in Fushimicho. Since its establishment, Fukuya has been producing “Fushimi-Monaka” for 84 years. Monaka is a wafer cake filled with red bean paste. A waffle cake of Fushimi-monaka is shaped as the tile of the Fushimi-yagura, a watchtower of Fukuyama Castle. Every morning, an owner fires up the stove taking his time to gently steam red beans. This is the very traditional way of cooking red beans. The red beans paste of Fukuya keeps the pure flavor of red beans since it does not contain any food additive. “Although it requires a tough work, we are proud of this traditional way of production. We won’t change it.”, said the hostess of Fukuya. After enjoying Fushimi-monaka, I went to “Imagawa-Chaho”, a tea stall stands next to Fukuya, to buy Japanese tea. A staff recommend me to drink tea in an attached tearoom, so I decided to rest there for a moment. Sipping hot Japanese tea, I felt warm and fluffy inside. What a wonderful trip it’s been! To know and have sweet desserts loved by the local people is one way to enjoy your trip. Why not drop by those local sweets shops in Fukuyama when strolling through the town.